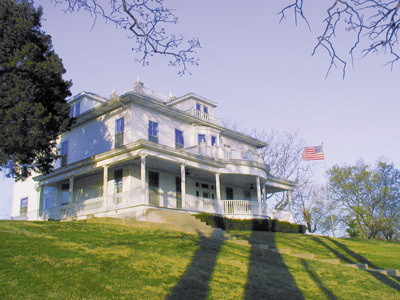 The Cohen Memorial Home is a beautiful historical site located on Harrison Street overlooking the Mississippi River. Its unusual blue storm windows make it a very visible landmark for boats on the river and travelers approaching the Chester Bridge from Missouri. Built in 1855, it was the home of the William Cohen family who lived there until the youngest son, Bud, died in 1983. The home is now owned by the city of Chester and operated by a committee of volunteers. The upstairs’ bedrooms contain furnishings and collections from several families of Chester including the Cohen family. The downstairs’ parlors are furnished with tables and chairs to facilitate use of the home as a meeting place*. Tours are available by appointment.